Plastic Cases – Packateers, Inc. Plastic is a versatile material that ranges in strength, resistance, density and flexibility. Industrial designers use plastic to create strong, insulating, chemical-resistant custom carrying cases. The most common kinds of plastic used for these cases are high density polyethylene (HDPE), fiberglass reinforced polyester (FRP), carbon fiber, rotationally molded polyethylene or linear low density polyethylene (LLDPE). 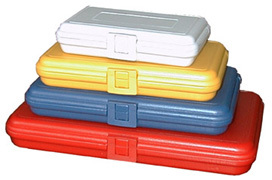 Plastic cases can be found in a variety of sizes and colors. They can be used to present and protect products, including fragile optical, measuring and medical instruments. This type of case is particularly useful in safeguarding delicate or sensitive items, such as medical, electronic and computer equipment. The fabrication methods used to product plastic cases have a direct impact on the case’s performance. Blow molding and rotational molding are two kinds of molding processes used to create plastic cases. Blow molding is the procedure whereby a hollow container, tank or case is created from a smaller model shape under pressure. Plastic resins such as polyethylene and polypropylene are commonly used in the molding process. Rotational molding, or rotomolding, is the process of rotating a mold while the plastic resin is being shaped into its final form. Plastic cases may also be formed through injection molding where hot plastic is poured into a mold cavity and left until cool. FRP plastics have fibers that must be woven, knit, braided or stitched together before they are bonded to the matrix, a tough plastic surface. Together the two materials form a very strong and stiff substance that is then molded through heat or compression into shape during composite molding. Wet molding is similar except that the matrix is reinforced with fibers while also being molded into a form. Some cases have metal frames for extra strength while under pressure. These frames are typically constructed of extruded aluminum that is welded together and mounted inside the tool case to provide support and structure. Plastic Cases Other kinds of carrying cases may be manufactured from aluminum, steel or wood; however, plastic is one of the most durable materials used in carrying cases. 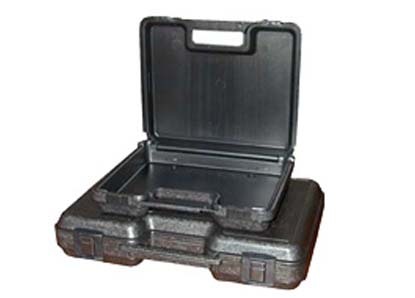 Since the durability of the carrying case often depends on the material from which the case is made, plastic carrying cases are very popular and widely used.